Meeting greenhouse gas emissions targets requires widespread electrification of transportation, however EV adoption has been slow so far. Uptake of EVs soon and at a significant scale is needed to meet our climate goals. Analysis is needed to determine whether today’s EVs, despite their battery energy storage limits, meet the needs of U.S. drivers and provide sufficient buffer for unexpected trips. A. The fraction of daily travel in the United States that can be accommodated by EVs that charge predominantly using standard 120 V wall outlets (also called Level 1 chargers, which are limited to 1.4 kW charging rates) in different charging locations. B. The increased fraction of daily travel patterns that can be accommodated by introducing additional charging locations and increasing the power level available at individual chargers. C. The impact of vehicle usage parameters on the ability for each charger and charging location scenario to accommodate daily travel patterns with EVs. For this case study, V2G-Sim is provided input data from the National Household Travel Survey (NHTS), which provides a survey of the 24-hour vehicle usage profiles of a random sample of drivers across the United States, including trip start and end times, trip distances, and types of locations where vehicles are parked. The NHTS provides 120,495 samples of weekday vehicle usage, 39,349 samples of weekend vehicle usage and appropriate weighting factors for each individual vehicle usage sample to construct a nationally representative description of when and where individual vehicles travel. Commercially available EVs are simulated in V2G-Sim to travel along the individual daily travel patterns specified by the NHTS data. While driving, each vehicle’s energy consumption and battery state-of-charge (SOC) is predicted using vehicle powertrain sub-models in V2G-Sim that are validated against measurement data. These powertrain models determine the EV’s energy consumption during a trip while accounting for the high energy conversion efficiency of chemical to electrical energy in the battery, and electrical to kinetic energy in the motor. When a vehicle parks at a location where it can plug into a certain type of charger (e.g. level 1 charger at 1.4 kW, level 2 charger at up to 7.2 kW, or fast charger), power transfer from the electricity grid to that vehicle is calculated using charging sub-models which are calibrated with measurement data. Figure 1 summarizes the percent of U.S. daily travel needs that can be satisfied by EVs, for various scenarios of the availability of charging infrastructure. Each EV has powertrain specifications resembling a Nissan Leaf in terms of battery capacity, battery power, motor efficiency, battery efficiency, vehicle mass, aerodynamics, etc. The results in Fig. 1 present a base case in three respects. First, each vehicle is driving on flat terrain. Second, an average level of ancillary power demand is assumed (1 kW, i.e. from lights, cabin heating or air conditioning, audio, and other power consumers on the vehicle battery). Third, a fresh battery pack that provides the rated energy storage capacity is simulated. Simulations are run for weekday and weekend travel with each set having 8 scenarios of charger availability, including level 1 chargers, level 2 chargers, or fast chargers available in different locations. The simulation results show that the high efficiency of EVs enables 89% of U.S. weekday travel and 85% of U.S. weekend travel to be accommodated using commercially available EVs, despite the limited energy that is stored in these EV batteries. These results are for a case where EVs are charged only using standard 120 V wall outlets at home locations. When 120 V wall outlets are made available at work places as well, 93% of weekday travel and 87% of weekend travel are satisfied using these efficient EVs. Indeed, Fig. 1 demonstrates that the greatest amount of U.S. travel can be accommodated when fast chargers are available everywhere. However, there is greater marginal benefit to making standard 120 V wall outlets available in all locations than from deploying faster chargers (which are significantly more expensive) in a smaller number of locations. satisfied by EVs with various scenarios of charger availability. What Figure 1 tells us: 85-89% of travel needs are satisfied with L1 charging at home only, and the increased benefit from charging with L1 or faster chargers in other locations is quantified. Greater benefits in terms of satisfying the mobility needs of drivers are observed from deploying L1 chargers in more locations than from deploying more expensive L2 chargers in fewer locations. Note: L1 chargers (standard 120 V wall outlets) are already widely available in many of these locations. Simultaneous combinations of scenarios 2, 3, and 4. The results in Fig. 3 address scenario 1 and the results in Fig. 4 address scenarios 2-5. Figure 3 shows the fraction of vehicles with different levels of buffer range to accommodate unexpected trips. The results in Fig. 3 are collected by identifying the minimum battery SOC that would be encountered for each vehicle’s individual daily travel and charging activity (see Fig. 2) and calculating the remaining usable EV range at that minimum SOC value. The results show that after accounting for the limited energy storage capacity of each vehicle battery, the high energy efficiency of EVs, and the normal expected travel for each vehicle, a large fraction of vehicles have substantial buffer in remaining range to accommodate unexpected trips. For instance, when vehicles are charged using standard 120 V wall outlets at home only, 77% of vehicles have over 60 km of buffer range during weekday travel, and 79% of vehicles have over 60 km of buffer range during weekend travel. When adding standard 120 V wall outlets at work locations, these values increase to 86% and 81% of vehicles having over 60 km of buffer range for unexpected trips on weekdays and weekends respectively. charging scenario. The minimum SOC is identified and converted to a remaining travel range. battery energy consumption from all daily trips under various scenarios of charger availability. What Figure 3 tells us: Large fractions of EVs have over 60 km of buffer range for unexpected trips, even if EVs charge with L1 chargers at home only. Driving uphill on a 3% grade for all trips. Of these three scenarios, uphill driving has the greatest impact on lowering the fraction of U.S. travel accommodated by EVs because the increased energy required to scale terrain with a 3% uphill grade outweighs the increased energy from higher ancillary energy consumption, or from reduced battery storage capacity. 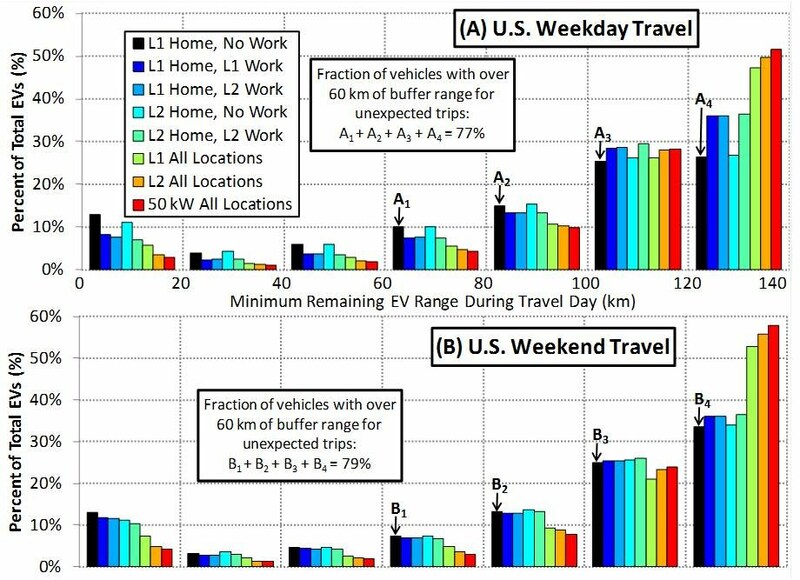 For instance, from the base case to the 3% uphill case, the fraction of U.S travel satisfied with EVs charging on 120 V wall outlets at home decreases from 89% to 70% for weekday travel and from 85% to 74% for weekend travel. The uniform 3% uphill grade case may be considered unrealistically extreme, as real world driving includes some flat or downhill terrain. Nevertheless, this case provides bounds on the percent of travel needs that can be satisfied. The worst case scenarios plotted in Fig. 4 present an even more extreme bounding result, where all vehicles are always driving uphill, with high levels of ancillary power consumption and with a vehicle battery that has lost 20% of its original capacity. In these worst case scenarios when vehicles are charged using standard 120 V wall outlets at home only, 56% of U.S. weekday travel and 45% of weekend travel is satisfied. the fraction of U.S. travel demand satisfied with EVs for the L1 charging scenarios. What Figure 4 tells us: Large fractions of U.S. mobility needs are still satisfied by EVs in each of the sensitivity analysis scenarios, suggesting that today’s EVs are resilient enough to accommodate many unforeseen scenarios. 89% of U.S. weekday travel and 85% of U.S. weekend travel can be accommodated using EVs that are charged on standard 120 V wall outlets at home only. Making 120 V wall outlets available for charging EVs at work places, or at all locations provides greater benefits for accommodating mobility requirements than making faster (and more expensive) chargers available at some of those locations. After accounting for the normal weekday and weekend travel, many vehicles will have significant remaining battery charge to accommodate unexpected trips. For instance, 77% and 79% of vehicles in weekday and weekend travel respectively will have over 60 km of buffer range for unexpected trips when charging only using standard 120 V wall outlets at home locations. 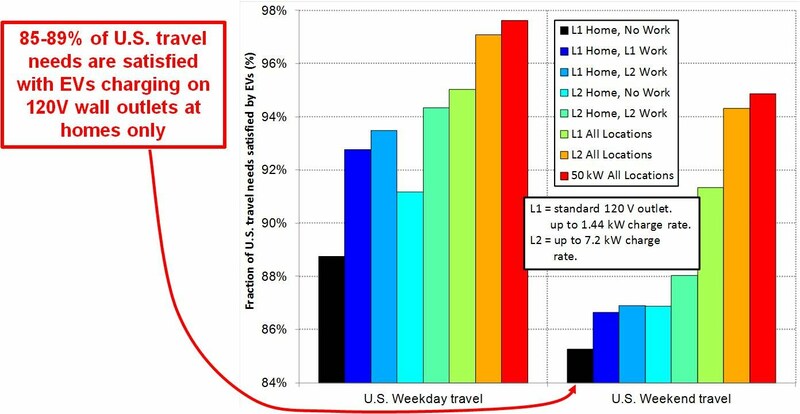 Higher ancillary power consumption, 20% reduced battery capacity, and driving continuously uphill decrease the fraction of U.S. weekday and weekend travel that is satisfied by EVs. 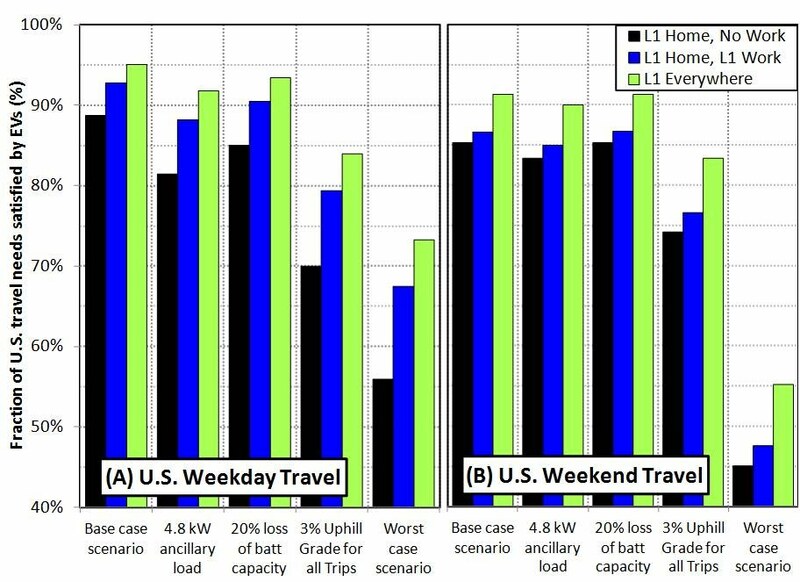 Of these three scenarios considered separately, uphill driving on a 3% grade has the greatest impact and leads to 70% and 74% of U.S. weekday and weekend travel being satisfied when charging EVs using 120 V wall outlets at home only.